Iconic jewellery brand Fabergé are having a sample sale next weekend! The first time I learned that Faberge even hosted sample sale I was astonished. A jewelers with such heritage and prestige opening up shop for a different demographic and price seemed unlikely but low and be-hold. This is a great opportunity to go and egg hunt for something truly special. Although prices will be up to 70% off you may still struggle to find a gem that's truly a bargain. 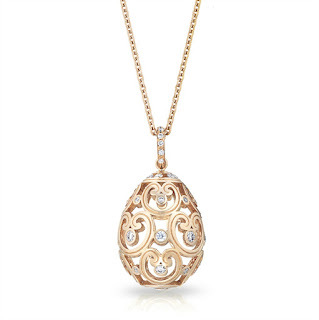 I would love to go to one before my next significant birthday as I am truly in love with the egg pendants. 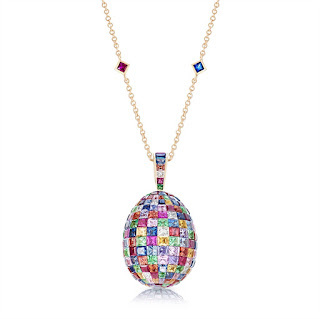 In particular the mosaic multi-coloured pendant which is a whopping £40,910.00. So let's do the maths, at 70%, which is still unlikely, this pendant is still £12,273. Funnily enough that's exactly £12,273 over my jewellery budget at the moment. However I will gladly point out to anyone who wants to know why on earth does she want this monstrous colourful glitter ball, it's made with 298 stones across diamonds, rubies, sapphires, tsavorites and white diamonds. If you add the carats across each stone type that is 53.78 carats of precious gemstones. Also did you not hear coloured glitter ball? Maybe I'll have to hunt for something more like the simple Impératcie Diamond Rose Pendant which at 70% off would come a mere £1663.80 compared to the mosaic multi coloured pendent. This delicate pendant features 47 round white diamonds totaling to 0.40 carats. Perhaps if you're planning to pop a truly big question this would be an opportune moment to look at some really fabulous jewellery and talk to someone in a more informal setting and seek out that special item. Make sure you rsvp to gain entry.